Now that I have got off of my train from Secaucus I start filming. Today we see many rare catches. We see many Amtrak trains with extra cafe cars and equipment and a few Amtrak Holiday Extra trains. Later on we see the MARC holiday extra train going up to New York with HHP-8 #4915 leading 6 single levels and an amfleet cafe in back. We catch many meets and different equipment. 1. Amtrak Regional train to Washington D.C. with AEM-7 #952 leading 8 amfleet cars. 2. NJ Transit ALP-46 #4600 arrives with 8 single levels going to New York. The train makes a stop and then departs. Cab car #6033 is trailing. 3. 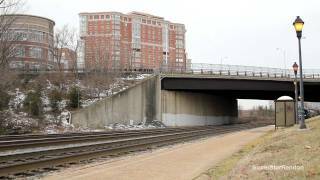 Amtrak Regional train flys by going to Washington D.C. with AEM-7AC #919 leading 8 amfleets. 4. NJ Transit ALP-46A #4635 is in the station going to New York pulling 10 multilevels. Cab car #7049 is trailing. 5. 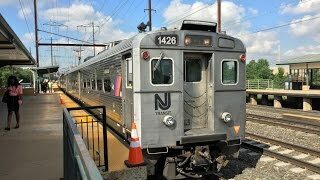 NJ Transit Arrow III EMU train arrives going to trenton with car #1340 leading with 10 cars. 6. Amtrak Acela Express to Washington D.C. with power car #2038 leading and #2016 trailing. Meanwhile an Arrow III EMU train is waiting in the station with 8 cars. 7. Amtrak Regional train to New York with HHP-8 #657 leading 9 amfleet cars. 8. Amtrak Silver Star train to Miami Florida with AEM-7AC #918 leading 11 cars. 1 Baggage, 3 Viewliner Sleepers, 1 Heritage Diner, 1 Amfleet Cafe and 5 Amfleet Coaches. 9. 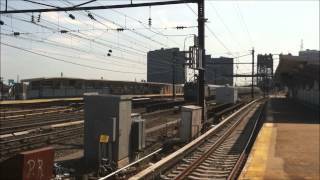 We catch the first Amtrak Holiday Extra train #1057 which has an 8 car NJ Transit Arrow III EMU train. Leading is car #1322 and trailing is car #1406 today. Arrow IIIs in this consist were #1322, #1379, #1378, #1320, #1415, #1414, #1407, and #1406. The engineer was very friendly and waved to me and the other guys on the opposite platform and blew the horn. 10. NJ Transit ACES train to New York with ALP-44 #4409 leading 4 ACES multilevels with P40DC #4802 trailing. 11. NJ Transit deadhead to Trenton. At first I thought this was another Amtrak Holiday Extra but then I knew that this was a deadhead to Trenton after I noticed that this would be too close to the first extra. 12. Amtrak Silver Service or Crecent train to New York with AEM-7AC #916 leading 10 cars. 1 Baggage, 2 Viewliner Sleepers, 1 Heritage Diner. 1 Amfleet Cafe and 5 Amfleet Coaches. 13. 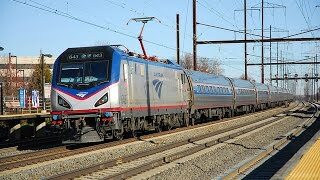 As an NJ Transit Arrow III EMU train departs for New York an Amtrak Acela Express to Washington D.C. flys by me with power car #2022 leading and #2011 trailing. 14. 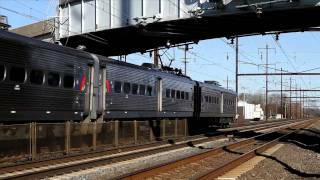 (RARE) We catch the second Amtrak Holiday Extra #1054 which is the MARC commuter extra train. Today MARC HHP-8 #4915 is leading 7 cars with 6 being MARC single level coaches and an Amfleet Cafe trailing. The coach behind HHP-8 #4915 is MARC single level cab car #7755 and next to the Amfleet coach is #7753. The consist is MARC HHP-8 #4915 followed by cab car #7755, #7729, #7700, #7723, #7796, #7753, and the Amfleet Cafe. 15. NJ Transit Atlantic City Deadhead with GP40PH-2B #4206 leading 4 coaches. Cab car #5015 is trailing. 16. 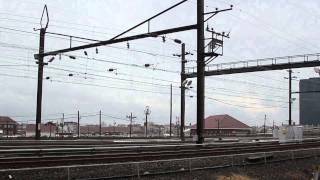 We catch a meet with 2 Amtrak Regionals with AEM-7s. The first one being #936 pulling 8 amfleets and the other (I didn't see the number) pulling 10 amfleets. 17. 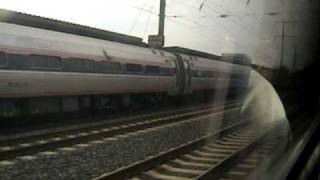 Amtrak Acela Express to New York with power car #2009 leading and #2020 trailing. 18. The Princeton shuttle departs with 2 Arrow III EMUs #1306 and #1317 going to Princeton. Thumbs Up, Comment, and Subscribe!